When we first rallied together as individuals to blog for ME/CFS Awareness in 2008 it was out of frustration at not being able to do very much for ME Awareness Day/Month and not being able to find an official web site with badges and banners. A lot has changed since and social media has mobilised a lot of people to do their bit. 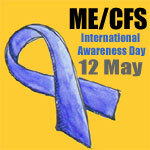 There is now an excellent resource on Facebook for May 12th – International ME/CFS & FM Awareness Day with a lot of support and I’d like to direct you there for inspiration and support on how to raise awareness. I think we have fulfilled our purpose and in many ways help to ingite a spark that others have carried through into bigger things. Our Blogging for ME/CFS Awareness and badges captured the imagination of people who went on to set up Blue Ribbon Campaign, then WAMCARE (who ran until 2010) and the well suported Facebook May 12th group. People who had a vision to do it bigger, to do it better. My own personal feelings about What Next with awareness campaigning is that fragmenting efforts doesn’t aid the cause. That it’s better to add your support to existing campaigns and infastructure especially when your individual contribution is hindered by your illness. Also that while our blogging has certainly helped to generate the seeds of bigger campaigns and has engaged individuals in using their voice, that often the word is only reaching those who are already aware of ME/CFS and FM. To be effective in raising awareness the message needs to reach people whose lives have never been touched by the illness. So, I feel it is better to use my energy to back the work of organisations out there working to raise awareness of ME/CFS every day and to advocate for PWME’s. I’ll still mark May 12th and use it as an excuse to try and raise the awareness of people I know who perhaps have very little understanding about my illness – in fact that’s something I try to do all year round anyway. But I don’t think continuing with Blogging for ME/CFS Awareness is something I want to do or something that is using our energies effectively. So I direct you to the Facebook resource for May 12th (you can see that without being having a Facebook account) or encourage you to support a ME group of your choosing in the work that they do. I see closing this blog as a big positive. We helped spark a momentum that others have run with and now there’s active awareness groups with a bigger remit and larger support. The spirit of May 12th (as started by RESCIND and continued with BRAME) was for one day to put aside our differences (cause, treatment, name of condition) and come together to raise awareness. In the interests of not fragmenting that support I think it’s time to end Blogging for ME/CFS Awareness and join our voices with larger organisations to be heard. I’ve made a range of Twibbons from the awareness badges. You can add a ribbon to your profile picture for things like blogging, Facebook and Twitter using Twibbon. The ribbons are free and allow you to create a unique badge for yourself. Bring the Centers for Disease Control website in line with the recommendations of leading researchers and practicing physicians in the field of ME/CFS. “Ellephantastic Draw in aid of Action for M.E. Find out more at Ellephantastic Draw in aid of Action for M.E. “Despite ME/CFS is biomedical condition, majority of medical practitioners do not want to treat it, because of the complexity and it is time-consuming to understand/treat. On top of that, they do not have relevant information about the condition. Governments hardly allocate research fund for ME/CFS. Without biomedical research into ME/CFS, we cannot have effective treatment. Some of biomedical researches into ME/CFS are on hold due to lack of funding… And a very little fund is continuingly wasted on psychological researches, which doesn’t give us any treatment. So far, the breakthrough findings about ME/CFS were funded by donation and/or private funding. “What is it like to suffer with ME? Those who are most severely affected can have the most horrible symptoms – paralysis, nausea leading to the inability to eat, hypersensitivity to light, sound, smell, fatigue so intense that they cannot even sit up. Some of the worst affected spend months or even years in dark rooms, flinching at every sound, in constant discomfort and totally dependent. I am fortunate – my illness has never reached this level. Since becoming ill 3.5 years ago I have always been able to look after myself, although sometimes with great difficulty and pain. you cannot be expected to understand the reality.